← The Giant’s Shoulders #55: Curiosities, Utility and Authority, is out! 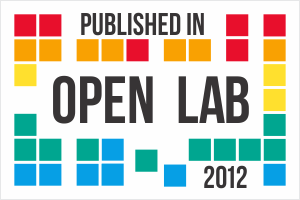 Government has always played, and hopefully will continue to play, a necessary role in scientific and medical research. Many important discoveries have been made through the use of government funding and in government labs, and many of those would never have been made in the private sector due to lack of marketability. However, government can also play a negative role in science, as is clear looking at any number of examples through history. One that really stands out are the Acts of Parliament in England starting in the 1500s related to the use of cadavers for dissection; these acts, and the failure to revise them quickly, led to an epidemic of grave-robbing that lasted until the early 1800s! Numerous and increasingly desperate attempts were made by people to protect their loved one’s bodies from unlawful removal; one of the most dramatic was the use of a “cemetery gun,” an automatic spring-tripped weapon that would shoot anyone who tampered with graves. As I understand it, these guns might be stationed above the grave, at the entrance to the cemetery, or even inside the coffin itself. Their tendency to accidentally shoot innocent people, however, eventually led to their being outlawed. There is very little information such weapons online. Recently, when I was searching for information, I came across a 1905 article in the John Hopkins Hospital Bulletin by G. Canby Robinson*, “The development of grave robbing in England.” This article provides an overall history of how the practice started in England and how extreme things became before its eventual demise; some of the tidbits are so fascinating that I had to share them here. There has always been a taboo against disturbing or desecrating the bodies of the dead in society; this taboo persists to a large extent to this day, though voluntary exceptions are allowed. By the early 1500s in England, however, medical science and surgery had developed to the point that fresh human cadavers were needed to properly train new practitioners, and in 1540 Parliament passed an act that allowed four executed criminals to be given to Barber-Surgeons for dissection. The number of murderers presented to medicine slowly increased, and by 1752 King George II decreed that all executed murderers were either to be hung for public display or sent for dissection. 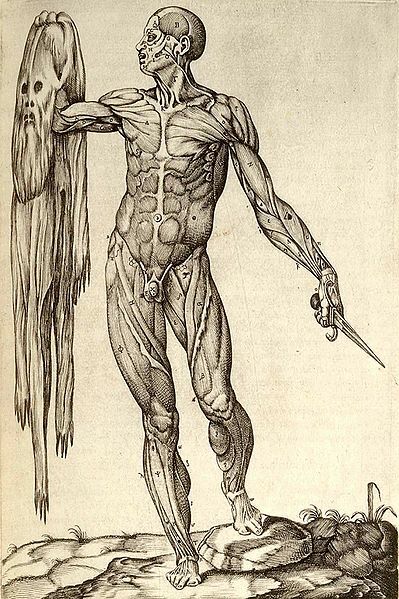 Anatomia del corpo humano by Juan Valverde de Amusco (1559), via Wikipedia. However, the growth of anatomical studies rapidly outpaced the available cadavers available, leading to fierce competition between schools for the available bodies. Robinson notes in his article that the use of executed criminals as subjects likely made the public more hesitant to donate their own bodies after death, as dissection became inextricably associated with shady characters. As not enough corpses were available through legal channels, a grisly form of capitalism took hold and grave robbers, known as “Resurrection Men,” began to harvest their own profits. The “Resurrection man” was in a position to do much harm to an unpopular school, and he had many ways of doing it. It is told that one teacher, Mr. Brookes, whose school had incurred the displeasure of the resurrectionists, awoke one morning to find a partially decomposed human body on his door steps, put there by these disgruntled robbers to arouse public indignation against him. On another occasion a subject for dissection was delivered to Mr. Brookes in a sack. Upon investigation the subject was found to be alive, and was probably so introduced into his house for purposes of robbery. This trade in human corpses was not carried on entirely by men, for we find that several of its tricks could be properly performed only by women. A spring gun was sometimes put over a new grave. The sorrowing mother or bereaved widow would appear a few hours after the funeral, and would go to the grave to let fall her mournful tears upon the freshly turned up mound, and incidentally to cut the wires leading to the spring gun. 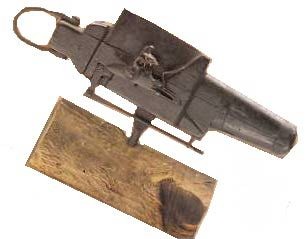 Image of a cemetery gun, from About.com. Then too a woman was especially useful for going to an anatomical school, and there with much grief to find her child or husband, whose body she had heard had been stolen. Nearly overcome by her great sorrow she would have the body removed, to be carried to the next anatomical school and resold, the gang thus gaining two prices for it. 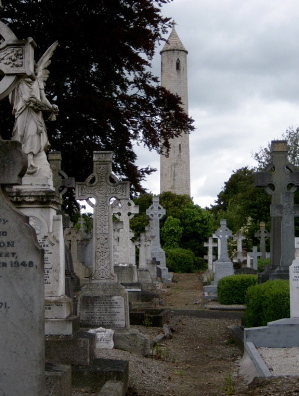 Glasnevin Cemetery, which opened in 1832, 2 years after the events described here. Via Wikipedia. The remains of the late Edward Barrett, Esq., having been interred in Glasnervin Churchyard on the 27th of last month — (January), persons were appointed to remain in the churchyard all night, to protect the corpse from the ‘sack-’em-up gentlemen,’ and it seems the precaution was not unnecessary, for on Saturday night last, some of the gentry made their appearance, but soon decamped on finding they were likely to be opposed. Nothing daunted, however, they returned on Tuesday morning with augmented force, and well armed. About ten minutes after two o’clock three or four of them were observed standing on the wall of the churchyard, while several others were endeavoring to get on it also. The party in the churchyard warned them off, and were replied to by a discharge from firearms. This brought on a general engagement, the ‘sack-’em-up’ gentlemen fired from behind the churchyard wall, by which they were defended, while their opponents on the watch fired from behind the tomb stones. Upwards of 58 to 60 shots were fired. One of the assailants was shot, he was seen to fall; his body was carried off by his companion. Some of them are supposed to have been severely wounded as a great quantity of blood was observed outside the churchyard wall, notwithstanding the ground was covered with snow. During the firing, which continued upwards of a quarter of an hour, the church bell was rung by one of the watchmen, which, with the discharge from the fire-arms, collected several of the towns-people and the police to the spot, several of the former, notwithstanding the severity of the weather, in nearly a state of nakedness; but the assailants were by this time defeated and effected their retreat. Even more common were fights between different groups of Resurrection Men over a piece of “turf” — in a figurative and literal sense. But the most horrific consequences would arise near the 1830s, when grave-robbers learned that it was much easier to make fresh corpses than to dig them up. In 1828, the city of Edinburgh was stunned to find that a series of murders-for-cadavers had been perpetrated by William Burke and William Hare, who generally suffocated to death invalid or intoxicated victims and delivered their bodies to a local doctor. Burke was hanged in January of 1829, while Hare turned evidence against him and went to prison. Their widely-publicized antics inspired another group of Resurrection Men, to be known as the “London Burkers,” to commit their own anatomy murders. In 1831 they delivered the suspiciously fresh corpse of an Italian boy to the King’s College School of Anatomy. The professor of anatomy summoned the police and the trio of “Burkers” were arrested and tried for murder. 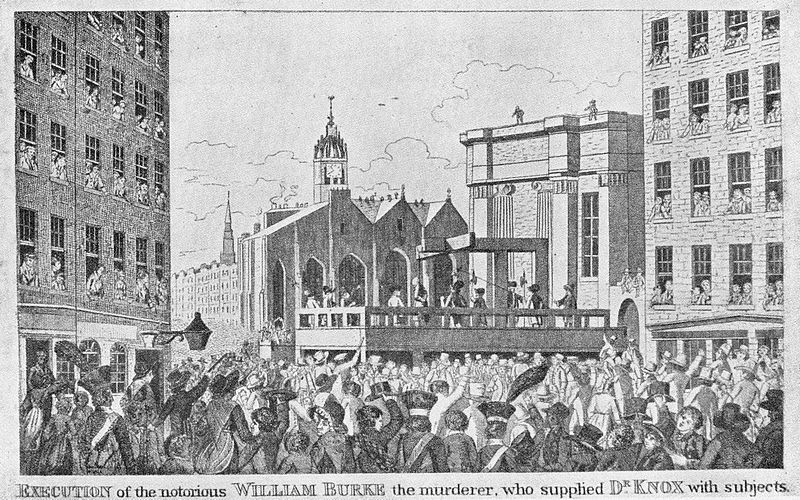 1829 print depicting the execution of William Burke, via Wikipedia. These crimes, and others similar, led to a public outcry and a revision of the law. The Anatomy Act of 1832 loosened the conditions on the types of dissection allowed, which had previously been restricted since 1752 only to executed murderers, and the trade in corpses faded. Thus ended the period in history when people were willing to murder to enter cemeteries, a sad illustration of the consequences when science, economics and culture collide. * G. Canby Robinson, “The development of grave robbing in England,” John Hopkins Hospital Bulletin, No. 167 (1905), 42-45.